Beef Teriyaki is a delicious, savory, five-ingredient dinner entree that is spectacular in taste and that is extremely easy to prepare. I make this with two cans of golden mushroom soup because the flavor is so much richer and deeper than regular cream of mushroom soup. This recipe also calls for a large can of mushrooms and a packet of Lipton onion soup mix. (I don’t actually use a whole packet). I keep all of the ingredients in my pantry (or freezer) so I have them on hand anytime I want to make this or other dishes with similar ingredients. 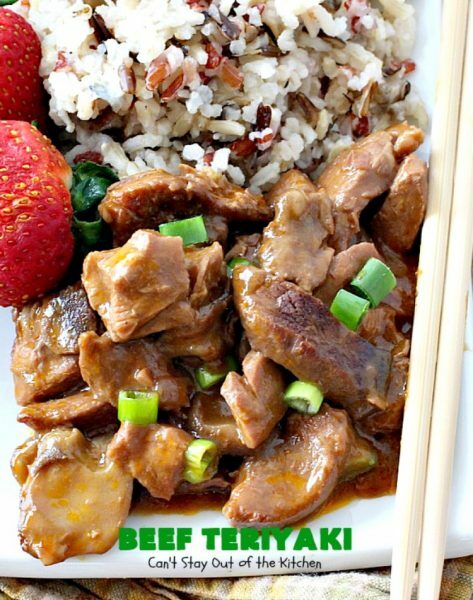 Beef Teriyaki is so EASY. I mean really EASY! Basically, you dump all the ingredients into a baking dish and bake this for three or four hours in the oven. That’s it. It takes all of five or ten minutes to open the cans and stir everything together before pouring it into the baking dish and tossing it into the oven! I’m sure you could make it in the crockpot just as easily, although, I’ve always baked it in the oven for more robust flavor due to the oven roasting. When my catering partner suggested this dish for an event we were catering for the Baptist Convention of New England back in the early 1990s, I was a little skeptical at first. Don’t you have to fry the beef first? Will it cook in the pan? This looks a little on the juicy side–will it really cook down some? Yes, she assured me allaying all my fears. And she was right. We served Beef Teriyaki over wild rice with mushrooms and it was always very well received. I made this the other day for a family who just had a baby and served it with plain brown rice. It was just as wonderful. If you’re looking for a quick and easy dinner entree that you don’t have to baby along with ten to thirteen different steps, then consider this succulent, amazing recipe for Beef Teriyaki. You can’t beat it for taste, and you certainly can’t beat it for ease. This is a great recipe for novice cooks looking to impress company without a lot of cooking experience. Our family has always loved this recipe and we believe you will too once you load up on the ingredients and make it for yourself! When I initially published this recipe in July 2013 I was a little disappointed with the pictures because the sun was setting so they seemed to have more of an orange hue than I would have preferred. I recently remade this recipe for our Friday night care group/Bible study in our home. Everyone enjoyed this delicious recipe, along with Pesto Asparagus, Popovers and Pina Colada Earthquake Cake which I also served. Here are a couple of pointers to make this recipe turn out well for you. Use only the onion portion of the onion soup mix. Using too much of the bouillon will overwhelm the beef. Dilute 1/4 cup of teriyaki sauce with 3/4 cup water. If you can find a low-sodium teriyaki sauce, that’s even better. The soup already has plenty of sodium so it helps to cut back in these ways. 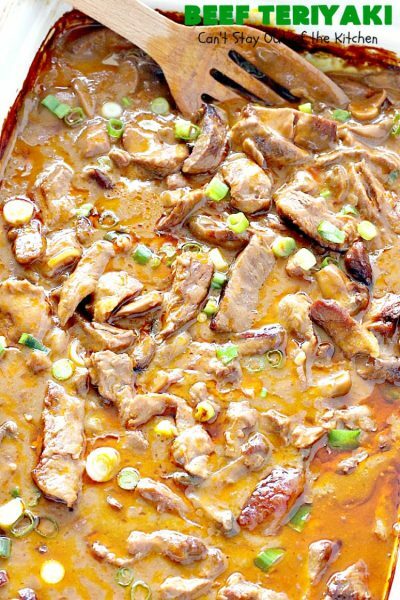 Additionally, don’t try to substitute regular cream of mushroom soup for the golden mushroom. It doesn’t have the seasonings or flavor to make this recipe turn out correctly. 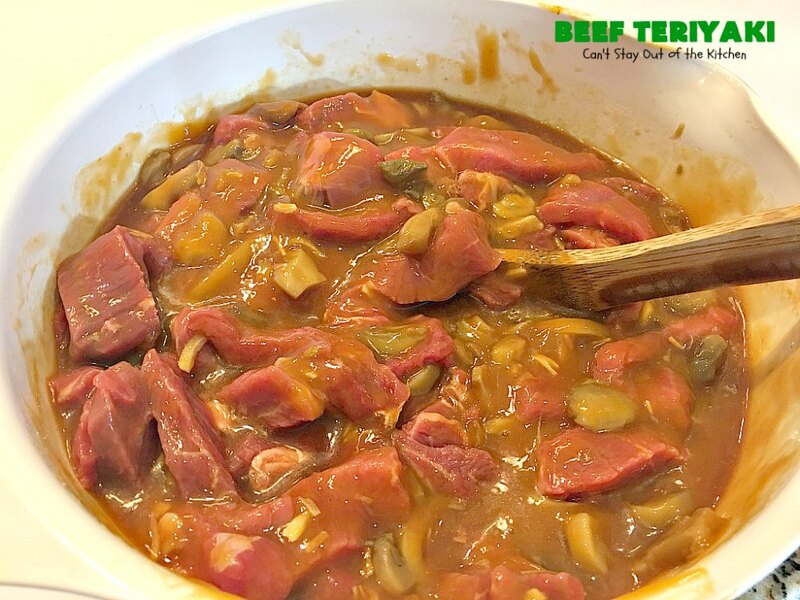 Don’t decrease the meat without decreasing all the other ingredients or the sauce will be too strong for the meat. Most of the time I cook this about 3 hours covered, then if it’s still a little soupy, I will uncover the dish and continue cooking up to an hour longer to get the liquid to absorb. 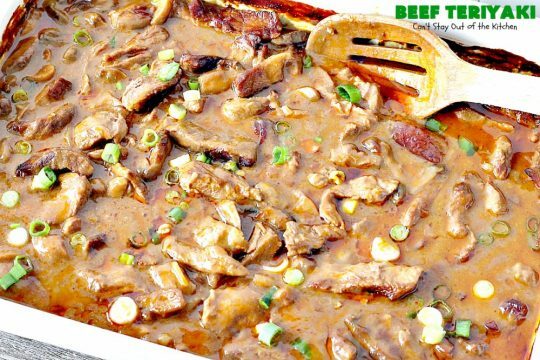 (Stir every so often so meat and mushrooms don’t get overly brown). That’s it. 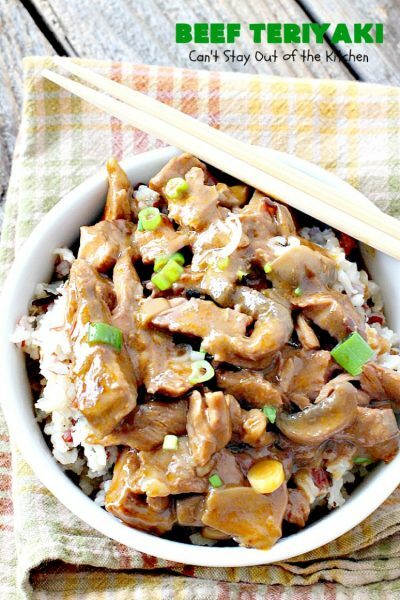 It’s a lovely main dish served over rice. 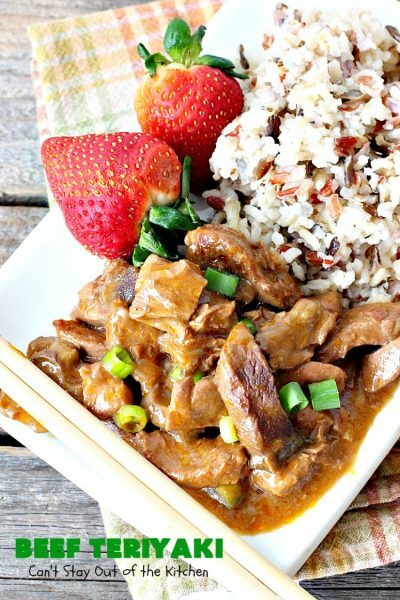 Beef Teriyaki is one of the most delicious meals you will ever serve your family! We serve Beef Teriyaki with either wild rice or brown rice. Black rice would also be an excellent option, too. 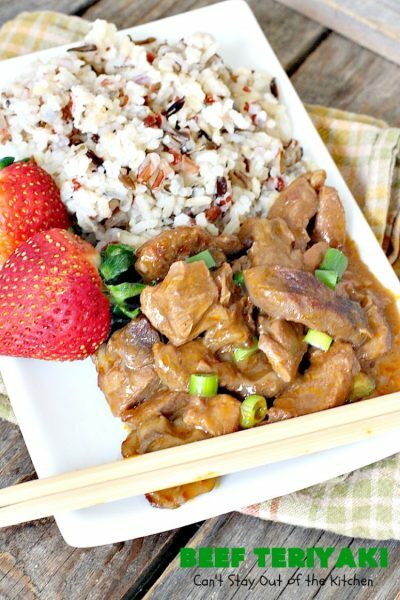 This sumptuous beef entree is also one of the quickest and easiest recipes you will ever put together! I used these ingredients. You will only use part of the onion soup mix. If you can locate a low-sodium teriyaki sauce, that would be preferred. 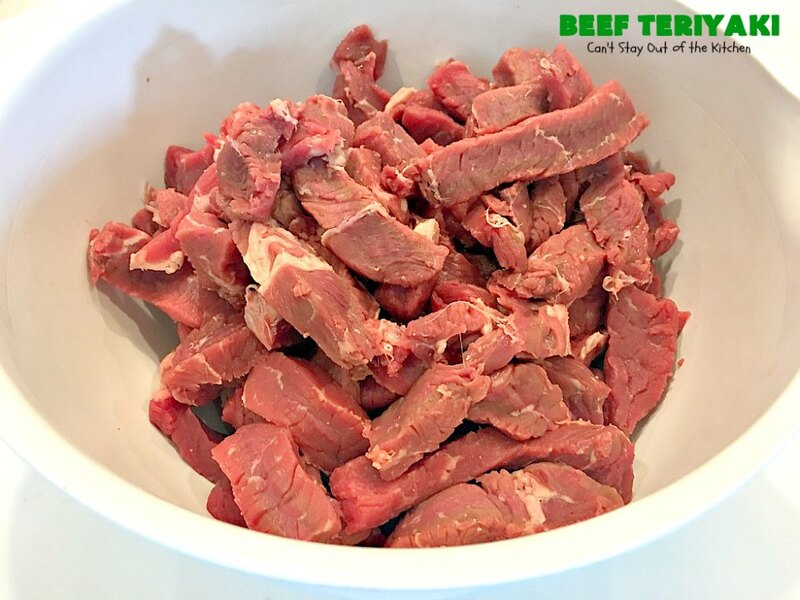 Cut sirloin sizzlers or steak into strips. 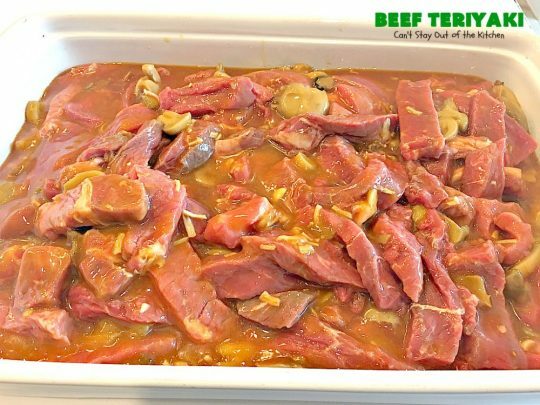 Toss raw meat into a mixing bowl. Separate the onions from all the bouillon in the onion soup mix. The easiest way to do this is to open the package and lift out the onions with a fork. (Shake excess bouillon so it goes back down into the package). I added a little bouillon but not the entire contents of the package or it’s too highly concentrated and overwhelms the beef. Add Golden Mushroom Soup rather than regular cream of mushroom soup. It has a richer, more savory and robust flavor than regular cream of mushroom soup. Add an 8-oz. 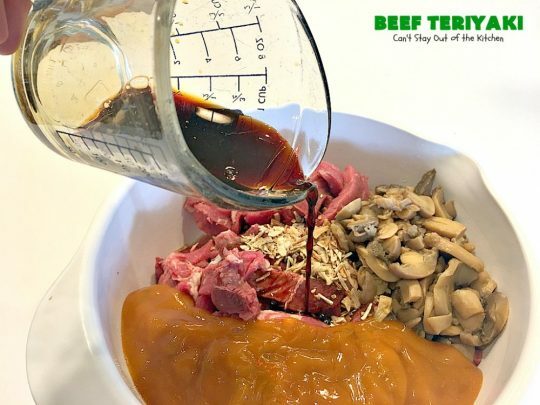 can of UNDRAINED mushrooms, the partial packet of Lipton onion soup mix (minus excess bouilon) and a 1/4 cup of teriyaki sauce mixed with 3/4 cup water. Spray a 9×13″ or 10×14″ glass baking dish with cooking spray. Add beef mixture and cover with foil. Bake at 350 for 3 hours. Remove foil. 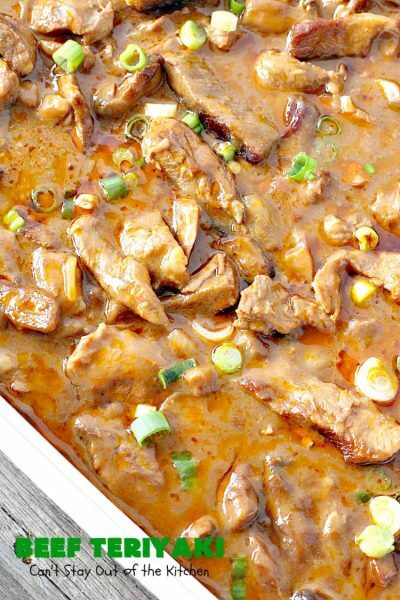 If meat is still too soupy, cook an additional hour stirring every 15 minutes or so, until more liquid is absorbed. Remove from oven and serve with cooked rice. I served this recipe with Basil Carrots the first time I made it. 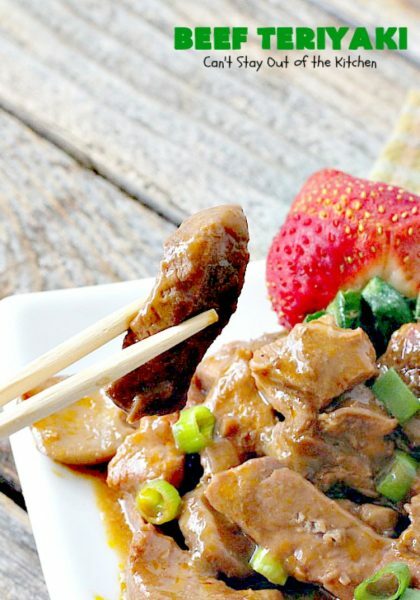 You can also use stew beef in this recipe, although I prefer sirloin sizzlers or sirloin steak. It’s amazing that the sauce ingredients cook down into this nice thick teriyaki sauce. I served Beef Teriyaki with soaked, cooked, whole-grain brown rice. Tasty and savory 5-ingredient beef main dish that is incredibly quick and easy to prepare. Serve over hot, cooked rice. Spread into greased 9x13” pan. Bake covered for 3 hours at 350°. Remove foil. If mixture is still a little soupy, cook an additional hour stirring every 15 minutes or so. Remove from oven and serve over hot, cooked rice. NOTE: You can use a whole Lipton onion soup mix packet if you prefer. I usually pick out most of the onions and use them along with only a very small portion of the salty, dry beef bouillon base. I discard the remaining bouillon mixture from the packet. If you prefer foods that are not quite as salty, I recommend you do the same. NOTE: The original recipe called for one cup of burgundy. Since I substitute teriyaki sauce instead it cannot be a completely one-to-one substitution because of the high sodium content. I use 1/4 cup teriyaki sauce plus 3/4 cup water to get the flavor but not to be overwhelmed with the salt and teriyaki flavor. NOTE: If you don't have a problem using alcohol in your cooking you can use 1 cup burgundy instead of the teriyaki sauce plus water in the recipe. NOTE: You cannot use the same amount of sauce ingredients for less meat. The sauce will overpower the meat and it will be too strong. NOTE: If you can find a low-sodium Teriyaki Sauce, that would be preferred over regular Teriyaki sauce. Spread into greased 9×13” pan. Bake for 3 hours, covered, at 350°. You can use a whole Lipton onion soup mix packet if you prefer. I usually pick out most of the onions and use them along with only a third or fourth of the salty, dry beef bouillon base. I discard the remaining bouillon mixture from the packet. If you prefer foods that are not quite as salty, I recommend you do the same. 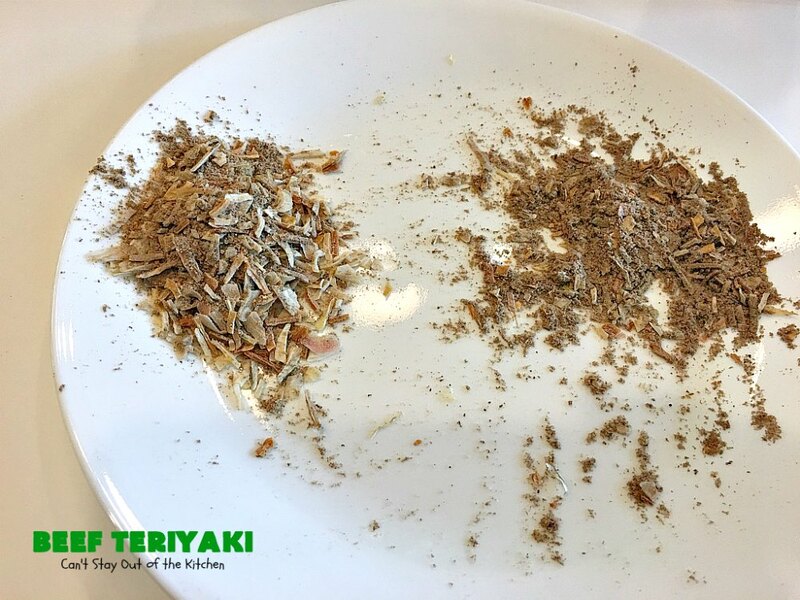 [br][br]You can also dilute the teriyaki sauce and use 1/2 cup sauce with 1/2 cup water, if you don’t want a strong teriyaki flavor. [br][br]You cannot use the same amount of sauce ingredients for less meat. The sauce will overpower the meat and it will be too strong. Beef Teriyaki is a quick, easy and an economical main dish your family will love. The sauce is just amazing. This main dish is also great for company. Everyone we’ve ever served this entree to has really enjoyed it. Time to sit down and eat! Hello! I made the beef teriyaki today and it was so salty I couldn’t eat it. 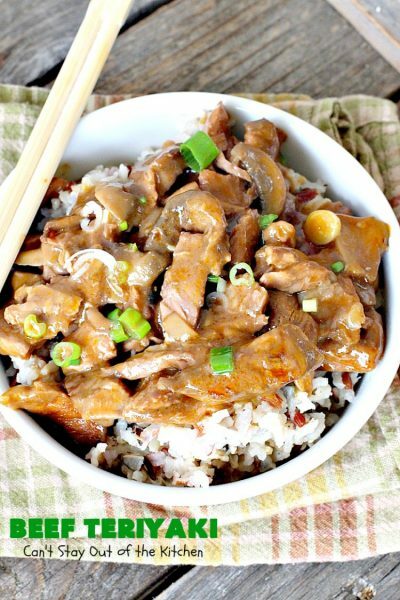 I used low sodium teriyaki and the rest of the ingredients in receipe. Do you think because I didn’t use as much beef as receipe called for that it would make that much of a difference? I used about 1.5 lbs. thanks for replying! I’m so sorry Susan, that it didn’t work out for you. We’ve always loved this recipe and never had it turn out bad. If you didn’t use 4 lbs. of meat, that may be comparable to using 4 cans of soups and twice as much of everything else. For now, I would go ahead and add some additional meat and if you need to add some water or even sour cream to dilute the excessive saltiness that may work. If you want to make it again sometime, you may also want to decrease the teriyaki sauce if that seems too strong for you. I’ve never actually made this recipe with less than 4 lbs. of meat – I’ve used more meat but not less. 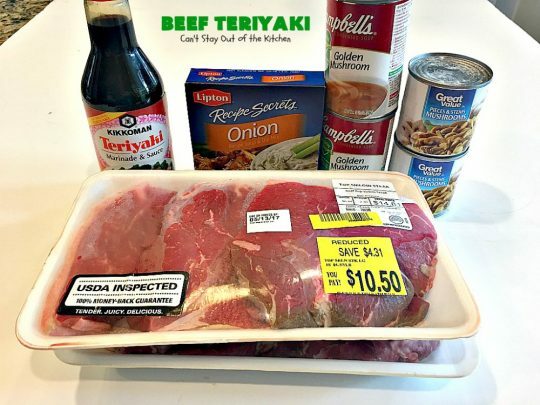 If you want to use less meat I would probably cut back to 1 can of soup, 1/3 cup teriyaki sauce and about 1/3 of a packet of Lipton Onion Soup Mix for 1 1/2 lbs. meat. I hope this helps.